Fast-paced, small arena Deathmatch level for 2-8 players, influences from Quake 3 and Mario Kart 64 Battle Mode. 'Space Chase' (fka '2001: A Jump Odyssey') is an older level of mine that I've recently cleaned up and improved upon in order to publicly release it. The original inspiration of the level was a mix of everyone's favorite Quake3 level, 'Q3DM17 - The Longest Yard' with the circular arenas of Mario Kart 64's multiplayer battle mode. A kart racer is a pretty strange starting point for an FPS level but I saw the parallels while watching this classic gameplay analysis of pro-level Quake3 play. In the video, you can see the players running a circular route around the level, constantly calculating the best path to get pickups and deny the opponent pickups. The 'route running' reminded me a lot of how people play MK64's battle mode, but with a lot more opportunity for changing directions. 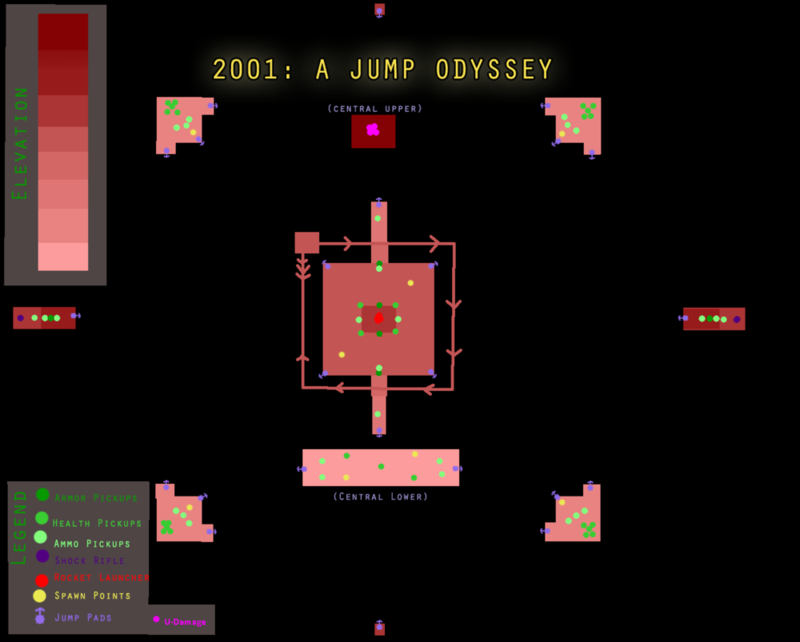 As you can see in the diagrams, the outer 4 platforms allow the players to run in a circular pattern, evading or chasing enemies. At any point, they may reverse directions or launch themselves into the middle. All paths lead to the middle, however, so this can be a dangerous place to stick around. From the middle though, there are 4 additional directions, leading to 2 shock rifles (a decent analog for Q3's rail gun and both are placed in good sniping positions), and 2 paths leading to the rocket launcher. The rocket launcher is placed just above the middle platform for maximum chaos. The biggest thing I learned about deathmatch level design is to give the player options. In this map, there are no corners to back yourself into, and you always have an opportunity to chase or evade. The smalles (but no less satisfying) thing I learned is that hitting someone with a shock rifle while they are flying through the open air is very difficult but extremely satisfying!